Children on scooters, adventurists in kayaks, dog lovers with their best pal on a leash and joggers in their favorite running shoes were among the many members of the Tulalip and Marysville community who gathered to celebrate the grand opening of the Ebey Waterfront Trail on April 22, a brisk Saturday morning. 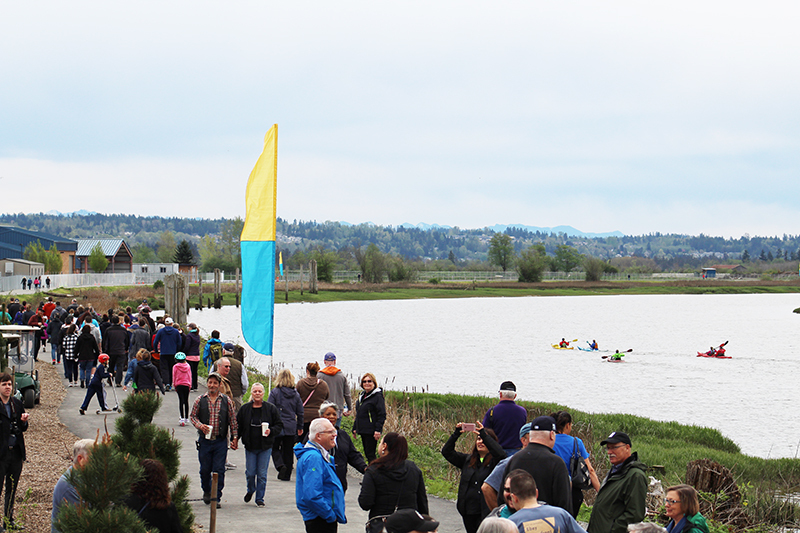 A traditional song, performed by Tulalip tribal members, blessed the trail prior to the official ribbon cutting. 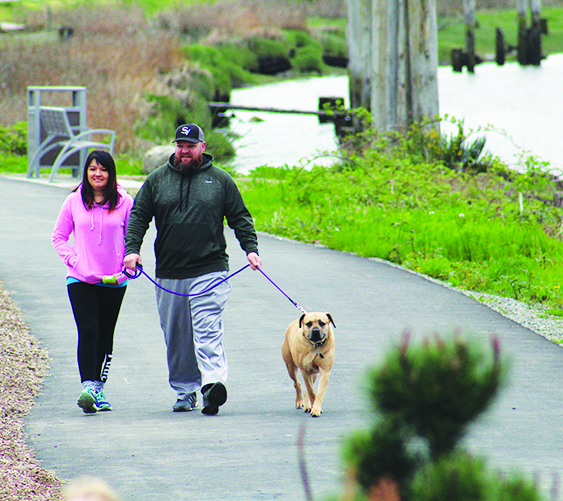 The 1.3-mile trail is located east of the SR-529 bridge, however, the city of Marysville plans to extend the trail over the next year and a half to create a five-mile loop with entry points throughout Marysville, including the Sunnyside area and the Ebey Waterfront Park. The trail extends along the Qwuloolt Estuary; an area the tribe has been restoring back to its natural habitat for the past seventeen years. Tulalip Chairwoman Marie Zackuse explained the history and importance of the Qwuloolt Estuary. “Our people used these estuary lands for fishing, hunting and harvesting, especially duck hunting. Our wild fish runs were healthy and productive until recent times and with the Qwuloolt restoration, our salmon have been given the opportunity to survive. 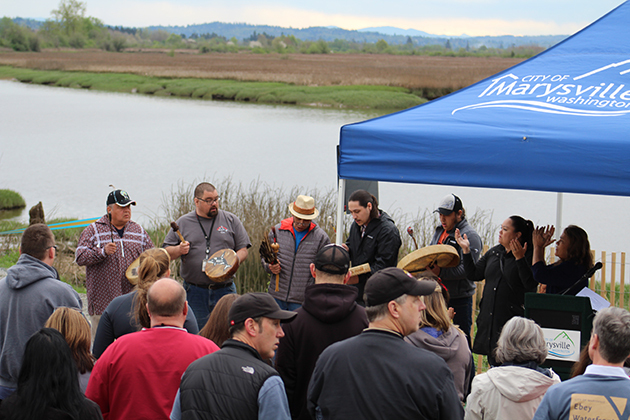 The Tribes are restoring and renewing sites in the estuary and in the Snohomish River that provide benefits to not only to the tribe but the public as well. One of the points we have emphasized over the years is the fact that the large scale restoration projects can make communities more livable, offer more recreational activities, more educational opportunities and the opportunity to see more habitat including many bird species. We hope that future signage will allow visitors to learn about the history of the tribe and how they used and interacted with this estuary in traditional times,” said Zackuse. 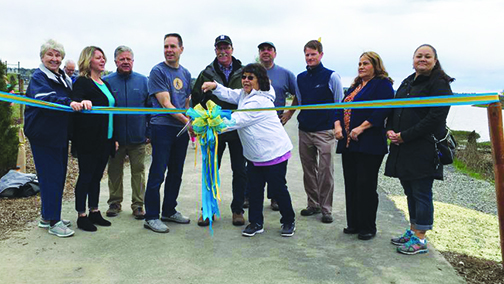 With the first of three phases complete, the City of Marysville and the Tulalip Tribes have provided their community members an opportunity to experience beautiful scenery and admire wildlife while enjoying outdoor recreation. This entry was posted in News, Top Story, Tulalip News by Kim Kalliber. Bookmark the permalink.